Nestled neatly in the neighbourhood of Dulwich Hill, Strawberry Fields Pattisserie has been serving up sweet toothed locals some of the best this town has to offer for nearly two years. The first time I visited Strawberry Fields, I was greeted by the brain behind the bread, Simon Bimson and his wonderful wife Kate . After a long conversation about sweets, croissants, travel and tattoos, I knew that Strawberry Fields Patisserie would be received by the locals with open arms - and it seems I was right! It's just what we needed. Tell us a little about your journey into pastry… Starting as a kitchen hand in Newtown was how I started in a commercial kitchen. I was 17 and looking for a decent paying job that needed no qualifications. I was living in halfway houses and trying best to support myself. I then was trained to be a baker, learning European techniques and loving my trade. My journey into pastry was out of the need to do more and be more creative than what baking offered. I wanted to be more inventive and realised that pastry was a good medium to satisfy my creative flair. What was the best advice you ever received, and how did it help shape your career? My dad was an astute business man. His wisdom and experience was something I always admired. He said a lot of good things over the years but one good piece of advice was that you have to make sure that you absolutely love what you do. If you love what you do and have a genuine passion for it, then going to work is not a chore. This helped me become more determined than ever and work as many hours as I needed to get the patisserie up and going. What was the inspiration that fuelled Strawberry Fields? For years working for other people, I was tired of not being able to change the menu, offering advice to owners and then getting told constantly to stay quiet and just keep working. All I wanted was to make croissants out of butter – not margarine, use good quality chocolate, make proper custard instead of junket and make cakes from scratch instead of using a premix. Owners wouldn’t allow me to have the finest ingredients so their products were always ordinary. It was something that made me start to hate my trade and feel disheartened. A couple of years ago I even started to think about an alternative career and get out of cooking all together. My wife Kate and I live in Dulwich Hill and have always loved the area, so when an opportunity came up to lease an already existing cake shop, we jumped at the chance. We weren’t ready but we couldn’t miss the opportunity. We signed the lease one week after we were married then went on a 5 week honeymoon to the US. We had no money saved and paid for everything by credit cards. We also owe a lot of people big favours - It was a gamble which has paid off. We totally transformed the existing shop and named it Strawberry Fields Patisserie. I always knew that what I had to offer was different and that with hard work we could survive. Setting up a company where we bake absolutely everything on site which makes me proud – even down to the tart shells. A process that takes time and means we are limited in our stock and to what we can produce but highly worth it. Our product is not made on an assembly line somewhere by inexperienced, unqualified staff – we are unique, fresh and singular. What was the biggest challenge while setting up Strawberry fields and how did you overcome it? The biggest challenge was our first year. It was hard going, newly married with no money and working 7 days a week was hard work. I was starting at 2am everyday and not getting home till 6 or 7pm. It wasn’t much of a life but at the time we couldn’t afford help in the kitchen. My body was starting to fall apart and so was my mental state. Overtime though we became busier, slowly we could start employing more staff and finally now after nearly 2 years, we can see the light at the end of the tunnel. We have a great team here who make my life so much easier. 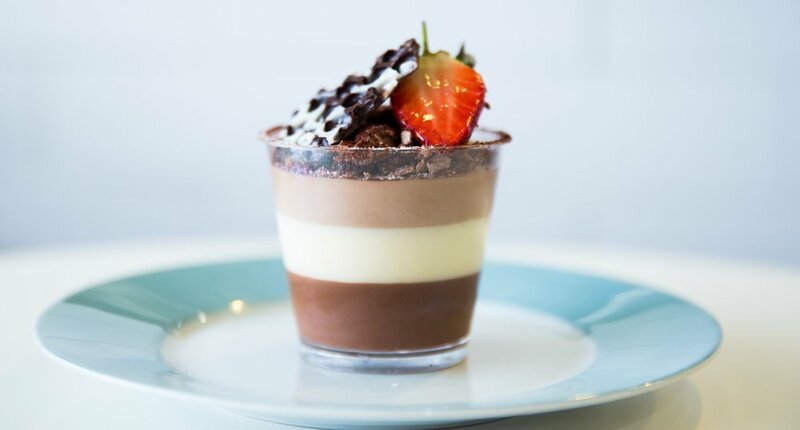 What inspires you to keep creating new and wonderful desserts? The change in the seasons is what inspires my food mostly. Inspiration is taken from everywhere and everything, whether it be our travels or family. I want to constantly better what I do so my team and I are always brainstorming and coming up with new ideas, such as introducing micro flowers on the cakes for spring while during winter we stick mostly to fresh apple pie, pear tarts and chocolate mousse. What do the locals love most? The fact that some of our locals can walk in and buy our bread, made with their ingredients. Because we are only small, we don’t have room to grow herb gardens or the like, so many of our locals grow their own and deliver it to us! The fact that we use such fresh ingredients and that the shop has a bit of character also benefits us. We cater for pretty much everyone our large open outdoor area is off the main road and nestled in a reserve so families love it. During a busy rush, what’s the first thing you run out of? Our Almond Croissant almost always sells out first. Many of our customers have told us that it is the best almond croissant they have ever had. Most days we can’t make enough of them. The bread and custard tarts also sell fast. What are the staff picks? Rebecca our chef would always say that the pies are special. Our new one for spring is our Beef and Guinness Pie, which is selling really well. The Pies are her domain and she is consistently talented with anything she makes. Our apprentice Emily is a baker by trade and is currently training to be a pastry chef. Her favourite is our French style Pumpkin, feta and leek quiche. Can we look forward to anything special for summer? Summer is berry season so our blueberry tart, strawberry tart and berry trifle are probably the picks of the season. It is also Christmas so we are already working on what we are doing for this period – Christmas cakes, mince tarts and gingerbread men will fill our shop. It’s a challenging and busy time for us but highly rewarding. Tell us about your travels… I have travelled to many places all over the globe – mainly to fuel my snow skiing addiction! I love the US and my brother lives in NYC. I haven’t been to Europe for a while but we are planning to get there soon. Favourite city: It’s a toss up between New York for its architecture, culture and atmosphere and San Francisco for its people and food. Best meal you ever had abroad: While we have stayed in 5 star restaurants and eaten in amazing places , my fondest memory was in San Francisco. We found this little Oyster bar called the ‘Swan Oyster Depot’– off the beaten track, introduced to us by a local. We tried everything from different oysters, sardines and prawns. It was one of our best experiences. The oysters were the best I had ever had. Worst meal you ever had abroad: TGIF in New York. Your fondest foodie memory is… Probably baking Christmas mince tarts with mum as a kid. When I make them now, it still takes me back. The three gadgets you can’t travel without: Bose headphones. iPod. Phone. Your most luxurious travel experience so far… Staying in the Four Season Hotel in Miami. As it was our honeymoon, we were upgraded and the whole 3 night stay was mind blowing. We met an Australian Executive Chef there - Aaron Brooks. He really ensured that our stay was wonderful and treated us to the best food that Miami had to offer. Best thing you ever purchased while traveling: I purchased in St Louis about 10 years ago now, The Culinary Institute of America book. At the time my dad said I was mad because it cost me a weeks wages and weighted about 10 kilos!! But I persevered taking it with me the whole trip. I am glad I did because I still use it today and it forms the basis of a lot of my recipes. Dream destination: Europe to include places I haven’t been such as Austria, Belgium and Germany. I can’t wait for the culinary delights especially with regards to their breads and cakes. Your next trip: We have booked Melbourne and Tasmania for these Summer holidays, after that we will be returning to the US to visit parts we haven’t been to before such as Boston, Tennessee and Chicago.